Reports over the past decade have detailed higher rates of illicit drug use, drug-related hospital admissions and overdoses among baby boomers in their later years than previous generations. A Wall Street Journal article last month described a “Woodstock mentality” that’s causing aging Americans to carry their youthful drug habits with them into middle age. A look at the data shows that plenty of baby boomers drink and smoke pot. But a relatively small percentage consume drugs other than alcohol and marijuana. Our analysis further reveals that boomers who do use drugs, including alcohol and marijuana, tend to use a lot. The availability and public perception of different drugs change, making it difficult to compare the drug use of a given age group over time. We were, however, able to analyze a 2012 survey on drug use from the federal Substance Abuse and Mental Health Data Archive (SAMHDA) to see what drugs baby boomers are taking now. Are their patterns of use different from other age groups? How similar are people within the baby-boomer cohort1 when it comes to drug use? Not surprisingly, boomers aged 50 to 64 have lower rates of drug use overall than their younger contemporaries; they also use less of each individual drug. 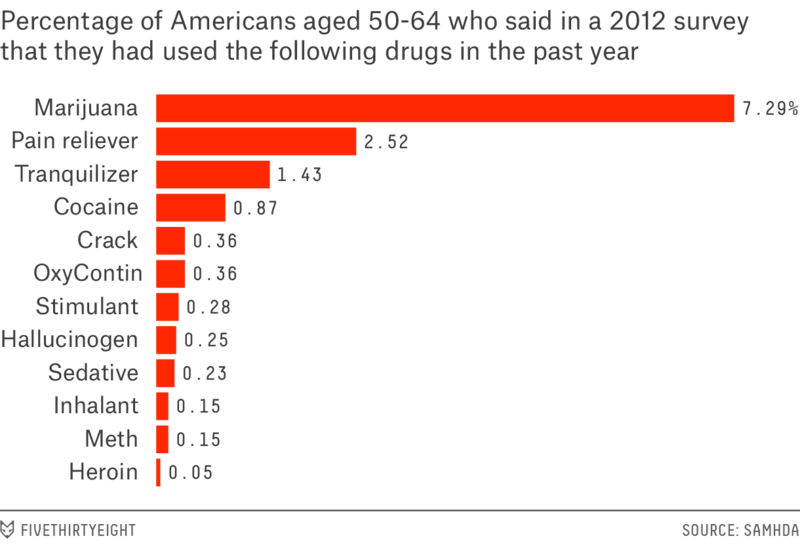 Alcohol and marijuana were the most commonly used drugs among all age groups (alcohol use was so high among boomers, 67 percent, that it dwarfed the differences among other drugs, and we opted to remove it from the chart above). For baby boomers, the next in line was prescription pain relievers, with 2.52 percent saying they’d used one for non-prescription purposes at least once in the previous year. Still, a smaller percentage of boomers used pain relievers than any other group over the age of 13.2 Respondents aged 50 to 64 also reported much lower use of hallucinogens, tranquilizers and stimulants (like amphetamines or Ritalin) than younger respondents. While people in the baby-boom generation use more drugs after they’ve turned 50 than their parents or grandparents did, younger boomers use a lot more than older boomers. From 2003 to 2012, illicit drug use, including marijuana, increased from 1.1 percent to 3.6 percent among 60- to 64-year-olds. For 50- to 54-year-olds, the rate went from 3.9 percent to 7.2 percent over the same period. When the boomers started turning 50, reports began warning about high use of narcotic painkillers among people aged 50-64. But the difference in drug use between younger and older boomers seems to be true for painkillers as well, with use dropping among older boomers as it grows for younger ones. While the painkiller category on the survey represents dozens of different prescription drugs, an additional set of questions asked specifically about one of the most common and problematic drugs from an addiction and abuse standpoint: OxyContin. We found that just 0.36 percent of 50- to 64-year-olds said they’d used OxyContin in the previous year, compared with a high of 1.72 percent among 20-year-olds. Still, given the extremely addictive and deadly nature of the drug, any illicit use is cause for concern. And it could be that some subgroup of boomers is particularly more likely to use OxyContin — something this analysis doesn’t answer. All of this data relates to use, which isn’t equivalent to abuse. From a public health standpoint, six drinks in a week is less concerning than binging on six drinks in a night; the occasional puff of marijuana is less cause for concern than a debilitating addiction. At present, older adults still make up a smaller share of admissions to federally funded drug treatment facilities than their share of the population. But baby boomers are more likely to die from an overdose than other generations, according to research done by Richard Miech, a professor at the University of Michigan. Miech said the lack of information on the death certificates makes it hard to know which drugs were responsible for the overdose deaths. The reasons for drug use are also different among an older population than younger users, regardless of generation. Researchers say that for older people, it’s less about getting high and more about coping with chronic pain, loss, social isolation or the effects of aging on the brain. Identifying shared traits among baby boomers with drug problems may reveal a different narrative than just a generation with a predilection for mind-altering substances. Download the data behind this story from GitHub. Baby boomers were born from 1946 to 1964, giving them an age range of 48 to 66 in 2012. The survey’s age breakdown of respondents includes the category 50-64, giving us a close approximation of the baby-boomer birth cohort. Other age group breakdowns in the survey don’t closely encompass specific birth cohorts, so we’re only looking at 2012 drug use among boomers compared to their contemporaries, not between generational birth cohorts. This isn’t to say the smaller percentage isn’t a concern: Use among older adults presents unique health concerns, and 2.52 percent use translates to more than a million people, given the size of the boomer cohort. We only looked at frequency of use among drugs used by more than 0.5 percent of respondents aged 50-64 because of the otherwise small sample size for frequency of use.